The unincorporated communities of Blacksville, Flippen, Kelleytown, and Ola are located near McDonough, and addresses in those communities have McDonough postal addresses. The town was named for naval officer Commodore Thomas Macdonough and founded in 1823 around a traditional town square design. The buildings surrounding the square are intact, although there are some vacancies. The county courthouse and historic jail building are on the north side near the Welcome Center in a historically maintained Standard Oil service station, built in 1920. The station also houses the Main Street Program Office and Hospitality and Tourism Office. In the center of the square is a monument to Henry County's Confederate dead. One block east of the square, the town's original cotton warehouse has been replaced with the Henry County Judicial Center. In the same area the Henry County Courthouse Annex has an original oil on canvas "Cotton Gin" (4½ by 11 feet) by artist Jean Charlot. He painted this oil in 1942 for the town post office. His works can be found all over the world in everything from children's books to large murals. The town was a relay station on the New York to New Orleans stagecoach line and was connected by other stage lines with Fayetteville and Decatur, and with Macon by way of Jackson. On June 24, 1900, a washout during a thunderstorm caused a train wreck about 1.5 miles (2.4 km) north of town. The runoff undermined about 100 feet (30 m) of the Georgia Southern Railroad (Macon division) prior to the accident, and the passenger train subsequently caught fire, killing 39. Several individual buildings and two historic districts in the city are listed on the National Register of Historic Places, including the downtown McDonough Historic District. McDonough is in central Henry County, 28 miles (45 km) southeast of downtown Atlanta. U.S. Route 23 passes through the center of the city, leading northwest 9 miles (14 km) to Stockbridge and south 7 miles (11 km) to Locust Grove. Interstate 75 passes through the southwestern arm of the city, with access from Exits 216, 218, and 221. 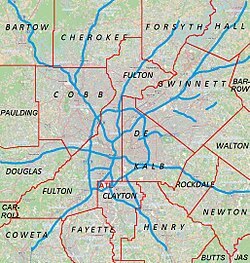 I-75 leads northwest to Atlanta and southeast 56 miles (90 km) to Macon. According to the United States Census Bureau, the city has a total area of 12.9 square miles (33.4 km2), of which 12.7 square miles (32.9 km2) are land and 0.2 square miles (0.5 km2), or 1.50%, are water. Xpress GA provides local bus service. At the 2000 census, there were 8,493 people, 3,069 households and 2,102 families residing in the city. The population density was 1,093.8 per square mile (422.6/km²). There were 3,234 housing units at an average density of 416.5 per square mile (160.9/km²). The racial makeup of the city was 61.4% white, 34.3% African American, 0.2% Native American, 1.4% Asian, 1.8% from other races, and 1% from two or more races. Hispanic or Latino of any race were 3.7% of the population. There were 3,069 households of which 35.7% had children under the age of 18 living with them, 45.2% were married couples living together, 18.8% had a female householder with no husband present, and 31.5% were non-families. 25.4% of all households were made up of individuals and 8.0% had someone living alone who was 65 years of age or older. The average household size was 2.61 and the average family size was 3.14. 26.4% of the population were under the age of 18, 10.6% from 18 to 24, 34.1% from 25 to 44, 16.8% from 45 to 64, and 12.1% who were 65 years of age or older. The median age was 31 years. For every 100 females, there were 90.3 males. For every 100 females age 18 and over, there were 86.1 males. The median household income was $40,482 and the median family income was $46,818. Males had a median income of $34,669 versus $28,318 for females. The per capita income for the city was $19,029. About 9.6% of families and 12.8% of the population were below the poverty line, including 13.3% of those under age 18 and 18.3% of those age 65 or over. Although it is considered to be located in Stockbridge many of the Eagle's Landing Country Club's homes are within McDonough's 30253 zip code. As of the 2010 United States Census, there were 22,084 people, 8,053 households, and 5,404 families residing in the city. The population density was 1,737.4 inhabitants per square mile (670.8/km2). There were 9,063 housing units at an average density of 713.6 per square mile (275.5/km2). The racial makeup of the city was 34.8% white, 58.2% black or African American, 1.8% Asian, 0.3% American Indian, 0.1% Pacific islander, 2.2% from other races, and 2.6% from two or more races. Those of Hispanic or Latino origin made up 6.1% of the population. Of the 8,053 households, 38.8% had children under the age of 18 living with them, 38.3% were married couples living together, 23.3% had a female householder with no husband present, 32.9% were non-families, and 28.1% of all households were made up of individuals. The average household size was 2.64 and the average family size was 3.25. The median age was 33.1 years. WKKP is the local radio media outlet. It broadcasts 24 hours a day on 100.9 FM and 1410 AM, and has a classic country format. It also broadcasts AP network news at the top of each hour, during the week. Snapper Inc. manufacturing residential and professional lawn care and snow removal equipment, was based in McDonough. The company began in 1894 as Southern Saw Works, and claims to have invented the first self-propelled rotary lawn mower. The company was sold to Briggs and Stratton, which operated the plant until its closure in 2015. The city hosts a Geranium Festival each springtime on the third Saturday in May, celebrating the locally grown flowers and community. The one-day festival serves as a showcase of local artistry and talent through the open-air craft markets and live musical performances. The festival is sponsored by the McDonough Lions Club, and held on the McDonough Square. 2009 marks the 32nd anniversary of the festival. The city's semi-professional soccer team Georgia Revolution FC plays in the National Premier Soccer League at the Warhawk Stadium. 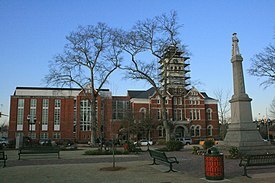 The film A Madea Christmas by Tyler Perry was filmed in the town square and all around McDonough. The television show, Resurrection was filmed in the town square and all around McDonough and was aired March 2014. Scenes for the 1977 movie Pickle Strikes Back III were filmed in the town. Scenes for the 1989 Oscar-winning Civil War epic, Glory were filmed in the town. A pilot episode for the WB show Roswell was filmed on the city square at the old Phillips 66 service station. A scene from the movie We Are Marshall was filmed on Hwy. 155 near Miller's Mill. "The McDonough Road" is mentioned by Rhett Butler in the 1939 classic, Gone with the Wind. The 1977 film Smokey and the Bandit was filmed primarily in Georgia in the cities of McDonough, Jonesboro, and Lithonia. The Henry County School District holds grades pre-school to grade twelve. The district has twenty eight elementary schools, nine middle schools, and ten high schools. The district has 1,543 full-time teachers and over 40,000 students. Gordon State College has a satellite center in McDonough and has been a partner with the Academy for Advanced Studies since 2009. Gordon State @ McDonough offers day and evening classes and has a weekend college program dedicated to Human Services baccalaureate degree. Mercer University has a Regional Academic Center in McDonough. The center, opened in 2003, offers Teacher Education programs through the university's Tift College of Education as well as programs in Criminal Justice and General Studies in the College of Continuing and Professional Studies. Additionally, Atlanta Bible College is located in McDonough. Renford Reese, Ph.D., son of pioneer sportswriter Earnest Reese (Atlanta Journal-Constitution); professor, author, founder, Colorful Flags program at Cal Poly Pomona University; grew up/went to high school in McDonough (graduated 1985). . Collective Soul, Band members used to live in McDonough in the early 2000s. ^ a b "Geographic Identifiers: 2010 Demographic Profile Data (G001): McDonough city, Georgia". American Factfinder. U.S. Census Bureau. Retrieved May 18, 2017. ^ "McDonough, GA Train Wreck, Jun 1900 - GenDisasters ... Genealogy in Tragedy, Disasters, Fires, Floods". www3.gendisasters.com. ^ a b c "DP-1 Profile of General Population and Housing Characteristics: 2010 Demographic Profile Data". United States Census Bureau. Retrieved 2016-11-28. ^ "Population, Housing Units, Area, and Density: 2010 - County". United States Census Bureau. Retrieved 2016-11-28. ^ "Contact Us." Goya Foods. Retrieved on March 26, 2016. "Goya Atlanta 4005 Haworth Parkway McDonough, GA 30253"
^ Maps of McDonough." U.S. Census Bureau. Retrieved on April 19, 2016. ^ Georgia Board of Education[permanent dead link], Retrieved June 19, 2010. ^ School Stats, Retrieved June 19, 2010. ^ Eagle's Landing Christian Academy, Retrieved June 19, 2010. ^ Community Christian School, Retrieved June 19, 2010. ^ New Creation Center, Retrieved June 19, 2010. ^ Creekside Christian Academy, Retrieved August 8, 2010. ^ "Daycare in McDonough, Georgia - Sunbrook Academy at Luella". ^ "Gordon State College". www.gordonstate.edu. ^ Reinhard, Beth (2011-05-20). "Home is Where the Votes Are". National Journal. Retrieved 21 May 2011.